Now in Space Gray with Thunderbolt 3, quad-core to 6-core processors, and 64GB of RAM. Subscribe for regular MacRumors news and future Mac mini info. 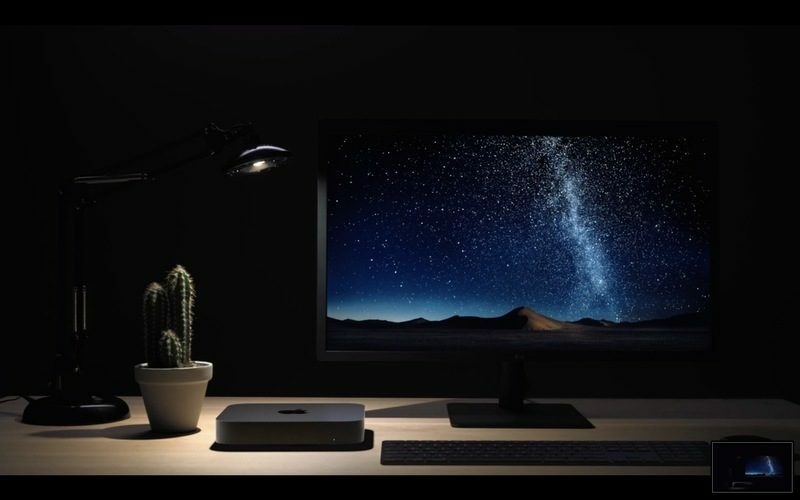 Apple in October 2018 updated the Mac mini for the first time since 2014, introducing entirely overhauled internals with upgrade options suitable for the company's pro user base. 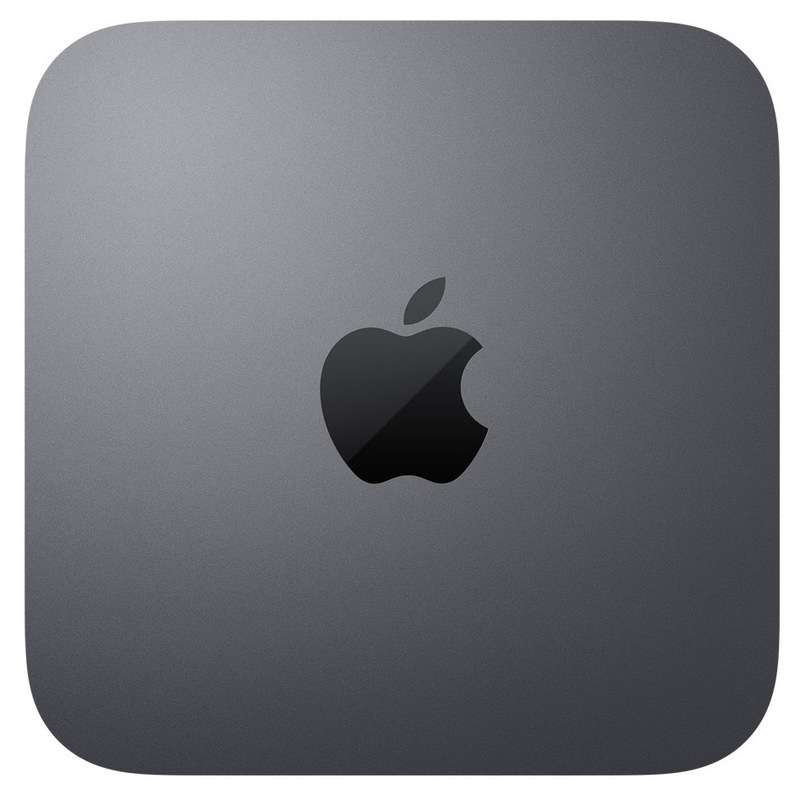 Now in Space Gray instead of Silver, the Mac mini looks like the previous-generation version with a flat, square-shaped 1.4-inch thick 7.7-inch wide aluminum unibody enclosure. Apple says that the new Mac mini is made from an Apple-designed aluminum alloy that's made from 100 percent recycled aluminum. For the first time, the Mac mini uses a quad-core processor for the base model instead of dual-core, with 6-core desktop-class processor options also available. The Mac mini is equipped with Intel's latest 8th-Generation Intel chips with integrated Intel UHD Graphics 630. Compared to the previous-generation four-year-old Mac mini, the new model is up to five times faster. The base Mac mini ships with 8GB RAM, but the little machine now supports up to 64GB RAM. All Mac mini models use solid state storage, with up to 2TB of storage available for build-to-order purchases. Apple says the SSDs in the Mac mini are up to four times faster than in prior models. The T2 chip first included in the iMac Pro and MacBook Pro has been built into the Mac mini for unparalleled security. The T2 includes an SSD controller with on-the-fly data encryption, HEVC video transcoding up to 30 times faster, and a Secure Enclave to make sure the software you're loading during the boot process hasn't been tampered with. Apple has outfitted the new Mac mini with plenty of ports able to support 4K and 5K displays. There are four Thunderbolt 3/USB-C ports, an HDMI 2.0 port, a 3.5mm headphone jack, two USB-A ports, and a Gigabit Ethernet port that can be upgraded to 10 Gigabit. Pricing on the Mac mini starts at $799 for the base model with a 3.6GHz processor, 128GB of storage, and 8GB RAM and goes up to $4,199 for a maxed out machine with 3.2GHz Core i7 processor, 64GB RAM, a 2TB SSD, and the upgraded 10Gb Ethernet option. The Mac mini is available for purchase from Apple's online store. Ahead of the launch of the updated 2018 Mac mini, Apple sent review units to multiple media sites, and we've gathered up a selection of reviews on the various features of the new machine below. Most reviewers agree that the 2018 Mac mini introduces some much-needed upgrades to the Mac mini lineup, but many of the upgrade options for the device are expensive. In the last few years, Intel has pushed the idea of extremely small desktop PCs, leading people like me to speculate that perhaps the next Mac mini would be even more mini. That didn't happen. Instead, Apple has decided to use the existing Mac mini design, a low-lying slab of machined aluminum with curved edges. The only real difference is that now it's darker, the old silver look replaced with a new space gray finish. The biggest turn on the I/O side of things, however, is the inclusion of an impressive four Thunderbolt 3 ports. That's the same number found on the iMac Pro and twice as many as you get on the 2017 standard iMac. It opens things up to a lot more computing versatility. As far as my own desk is concerned, I welcome the ability to power the LG 4K monitor Apple sent along for testing purposes. The ports are different, and versatile. Like the iMac Pro, the Mac mini recognizes that it's useful to offer both USB-C/Thunderbolt 3 and USB-A ports. There are four of those Thunderbolt 3 ports, two classic USB-A ports, HDMI, a headphone jack, and Ethernet--Gigabit by default, with up to 10Gb Nbase-T Ethernet available as a $100 option. You can hang two 4K displays or one 5K display off of the Thunderbolt 3 ports. You can use adapters to connect to Thunderbolt 3 or Thunderbolt 2 or to give yourself more USB-A or... really, whatever you can think of. It's a lot of ports. The $799 model comes with a 128GB drive, but if that isn't enough, Apple offers upgrades all the way up to 2TB if you're willing to pay. The SSDs are PCI-e cards and Apple doesn't consider them user-upgradeable. So, if you prefer to house your storage inside the computer instead of attaching an external drive, you might consider shelling out more money for an upgrade. The $799 Mac mini comes standard with 8GB of 2666MHz DDR4 memory, installed as a pair of 4GB SO-DIMMs. The mini supports a maximum of 64GB, and you can upgrade the memory later, but Apple doesn't consider the Mac mini to be user-configurable, and it recommends that memory upgrades be performed by a certified Apple service provider. Today the Mac mini is about flexibility and filling niches. This update allows it to span a wide range from basic server needs all the way up to high-end applications that require a great deal of processor power, fast storage, ultra-fast networking, and even beyond (via Thunderbolt 3). The high-end configurations might actually provide enough power for people to consider them over buying the Mac Pro, whenever it comes out. The big story to me is how incredibly fast this thing is. Granted, I'm testing the fastest CPU offered, but damn. Geekbench results are very strong. The i7 Mac Mini scored better on single-core performance than every other Mac today (!) at 5912, and its multi-core score of nearly 24,740 beats every Mac to date except the iMac Pro and the old 12-core 2013 Mac Pro. "Performance-competitive with pro Macs" was not high on my prediction list for a Mac Mini update, but here we are. For many pros, it may be hamstrung by Intel's integrated graphics processor. I'm not saying it needs a powerful gaming or rendering GPU. A Kaby Lake G CPU, for example, would be a nice alternative to the i3 simply to make the system low-end VR ready, to take some of the video decoding burden or to help reduce overhead in audio production. Apple really seems to be betting on external GPUs as a solution for much of its graphics woes. But one of the benefits of the Mini is that it's mini. Having to make space for a big eGPU just for better-than-basic graphics acceleration kind of defeats the purpose of a tiny system, especially when you're likely going to be hanging a multitude of external drives and other accessories off it as well. Even the lowest-speced version should be plenty fine for most tasks. I've shifted my standard tech blogger work flow over the machine for the last couple of days and am perfectly happy with the results. On the other hand, if your workload requires anything processor or graphics intensive, you're going to want to pimp this thing out -- or seriously consider picking up a desktop with the word "Pro" in the name. Apple lent me a high-end configuration for review -- 6-core i7, 32 GB RAM, 1 TB SSD -- which would cost $2499 (much of which is the SSD). This would've sounded crazy to spend on a Mac Mini a few years ago, but when it's specced up like this, it's targeting a much higher-end market than the previous model could. Compared to similarly specced iMacs and MacBook Pros, the pricing is generally reasonable. For the budget-strapped, it's also easy to flinch at the $300 price increase on the base-level. While it's true that the components are pricier this time, it's hard to shake the feeling that the company has priced out the true entry-level user this time out, in favor of offering a product that's more of a gateway into the Pro ecosystem. Other Reviews: Tom's Guide, MobileSyrup, ZDNet, and PCMag. With the 2018 update, Apple didn't change the design of the Mac mini, but it does come in a new color: Space Gray. Space Gray is now the only Mac mini option, with no Silver choice available. The Mac mini has always been Apple's smallest, most portable desktop machine and that hasn't changed in 2018. The Mac mini continues to feature a small, square-shaped enclosure that measures in at 7.7 inches on each side and 1.4 inches thick. Apple's Mac mini weighs in at just 2.9 pounds, so it's small enough to take from place to place if desired, plugging into available peripherals and displays. The Mac mini, unlike Apple's other Macs, does not ship with a display, keyboard, or mouse, so it is ideal for those who want to supply their own accessories. One side of the Mac mini features a host of ports, while the other features an LED that lets you know when it's on. There's an Apple logo at the top of the device, and other than the Apple logo and port labels, there are no other markings on the visible portion of the machine. Though the exterior of the Mac mini is unchanged, Apple has redesigned the interior with an all new thermal architecture to accommodate higher-powered 8th-generation chips and all-flash storage. It features a bigger internal fan with twice as much airflow, expanded vents, and a revamped power supply that offers 70 percent more maximum sustained power. Apple has outfitted the Mac mini with a whole host of ports, allowing it to be used with multiple peripherals at once. It doesn't quite measure up to the iMac Pro when it comes to the number of ports available, but it's not far off. There are a total of four Thunderbolt 3/USB-C 3.1 Gen 2 ports at the back of the device, which are able to support USB-C accessories and 4K and 5K displays, along with an HDMI 2.0 port, a Gigabit Ethernet port (which can be upgraded to 10Gb), a 3.5mm headphone jack, two USB-A ports, and a spot for the power cord to plug in. Thunderbolt 3 offers data transfer speeds of up to 40Gb/s, along with the ability to connect two 4K displays (along with a third 4K display over HDMI) or one 5K display. The 2018 Mac mini's RAM can be replaced, but it's not an easy process. Apple does not consider the RAM officially user upgradeable because to get to the RAM, the Mac mini needs to be taken apart. For that reason, Apple recommends taking the Mac mini to an Apple Authorized Service Provider for RAM upgrades with Apple-supplied RAM, but those who want a cheaper solution can perform RAM upgrades following guidelines and walkthroughs on the web. The storage and the CPU of the Mac mini are soldered in place and cannot be upgraded or replaced. The Mac mini is using 4 and 6-core 8th-Generation Coffee Lake processors from Intel. The entry-level base model ships with a 3.6GHz quad-core 8th-generation 3.6GHz Intel Core i3 processor, while the higher-end base model features a 3.0GHz 6-core 8th-generation Intel Core i5 processor. A higher-end 3.2GHz 6‑core 8th‑generation Intel Core i7 processor is available as an upgrade option. Benchmarks of the high-end 6-core 3.2GHz processor suggest the Mac mini's performance is equivalent to the high-end 2018 MacBook Pro and the late 2013 Mac Pro models, with the Mac mini earning some of the best single-core performance scores. The high-end Mac mini features a single-core Geekbench score of 5708, and a multi-core score of 24340. The base-level model's performance is on par with lower-end 2018 MacBook Pro models, earning a single-core score of 4790 and a multi-core score of 14460. The middle-tier 6-core Mac mini with 3.0GHz Core i5 processor earned a single-core score of 5098 and a multi-core score of 20341, performance not too far off from higher-end 6-core MacBook Pro performance. Apple says the new Mac mini is up to five times faster than the previous-generation model, last updated in 2014. All Mac mini models feature integrated Intel UHD Graphics 630, with no GPU upgrade options available and no discrete GPU options provided by Apple. The Mac mini can, however, be used with eGPU setups when additional graphics power is required. The Intel integrated graphics are up to 60 percent faster than the previous-generation Mac mini. All base Mac mini models ship with 8GB 2666MHz DDR4 RAM, which can be upgraded to 16, 32, or 64GB for an additional fee. 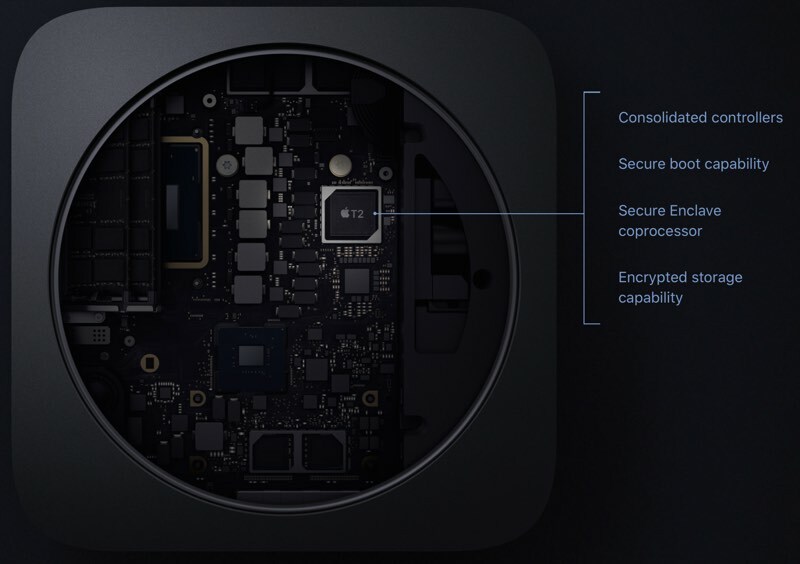 Like the iMac Pro, MacBook Pro, and MacBook Air, the 2018 Mac mini is equipped with a custom Apple-designed T2 chip, which integrates components like the system management controller, image signal processor for the camera, audio control, SSD controller, a Secure Enclave, and a hardware encryption engine. Apple's T2 chip makes sure all of the data on the SSD is encrypted using dedicated AES hardware, and it ensures a secure boot to make sure your software isn't tampered with and only OS software trusted by Apple loads at startup. All Mac mini machines now feature PCIe-based storage, with no traditional hard drives available. The SSDs in the Mac mini offer four times faster read speeds (up to 3.4GB/s) than the SSDs in previous Mac mini options. Apple offers up to 2TB of storage in the Mac mini, but base models ship with 128 and 256GB. The Mac mini supports 802.11ac Wi-Fi and Bluetooth 5.0. It comes equipped with 10/100/1000BASE-T Gigabit Ethernet, which can be upgraded to 10Gb Ethernet with support for 1Gb, 2.5Gb, 5Gb, and 10Gb Ethernet. $799 - 3.6GHz quad-core 8th-generation Intel Core i3 chip, 8GB RAM, Intel UHD Graphics 630, and a 128GB SSD. $1,099 - 3.0GHz 6-core 8th-generation Intel core i5 chip, 8GB RAM, Intel UHD Graphics 630, and a 256GB SSD. The Mac mini can be purchased from the Apple online store and Apple retail locations around the world. As of January 2019, Apple is selling discounted 2018 Mac mini models in its refurbished store.